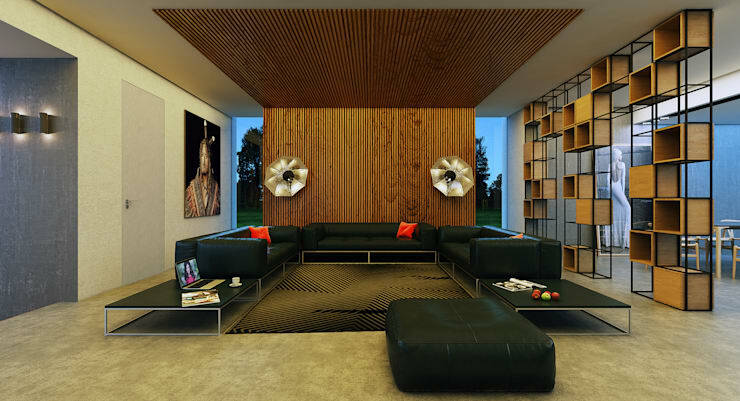 If you have a big family then architect Aleksander Zhydkoz has just the house plans for you. This home is nothing short of a mansion, with huge seating areas in every room (even in the kitchen) that a huge family can enjoy. The style is modern and fresh, with an emphasis on fun wall materials and stylish furniture. 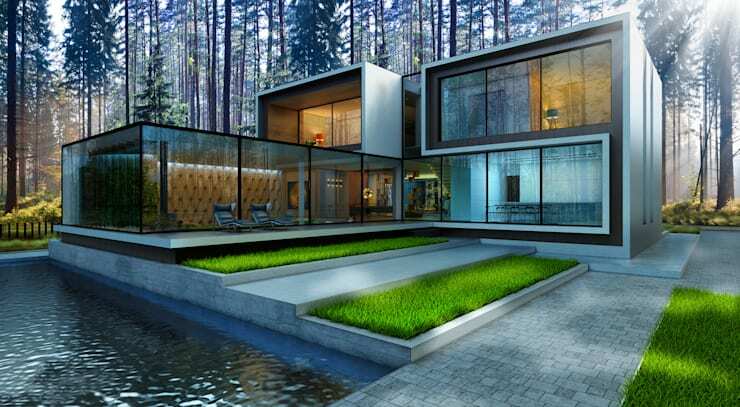 Let's check out this exceptional mock-up of this modern mansion! This gorgeous exterior is composed of distinct cubes in glass and simple white plaster. While this combination is classic modern, this design puts an unusual spin on it by incorporating a long rectangular based that looks out over the three-step lawn. This living space combines some amazing wall textures for a fresh and modern look. We've never seen the diamond shape on the creamy brown wall before. 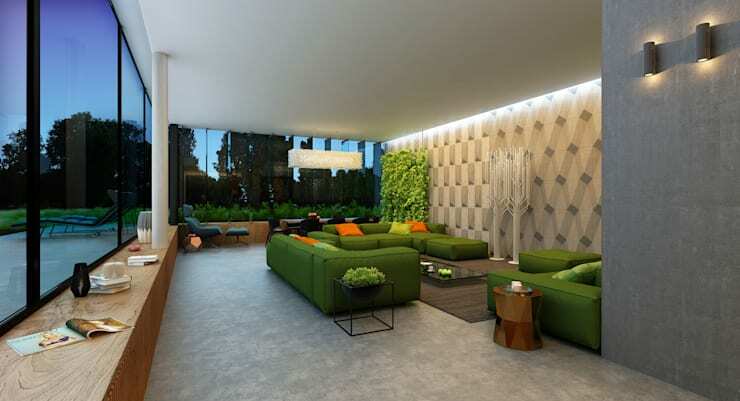 Then there's the vertical garden on the wall that feels lively and adds incredible texture. The lighting fixture above the table picks up on that same texture too. From the entrance to this space we can see that the couches carry the green through the room, and boy are there a lot of couches! The long wooden border to the room could even function as additional seating, if you were throwing a party in here! Otherwise, the wood is a great accent to the natural emphasis on the room and provides convenient storage space. This dramatic long island has enough seating for seven family members! That doesn`t even include the lovely black table behind it. As far as style goes this simple white kitchen is the height of minimalism. 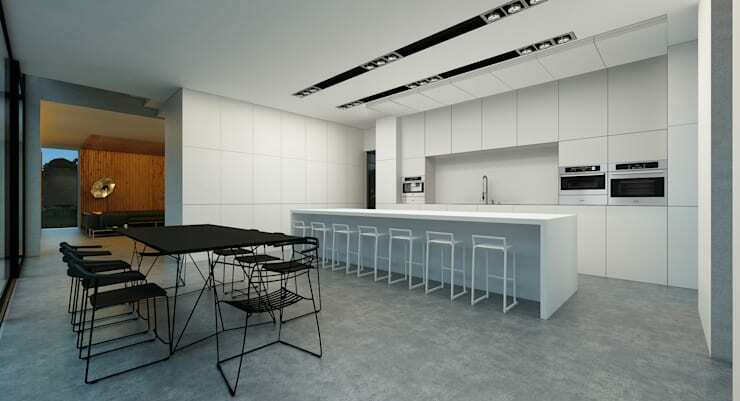 There`s no handle, no colour, and even the lighting on the ceiling is as unobtrusive as possible. On the other hand, the kitchen has more storage than you could ever need, and sleek modern appliances that tuck into the walls. If this kind of ultra minimalist kitchen just isn`t for you, then you`ll prefer these 16 special kitchens that have more personality while remaining just as modern. 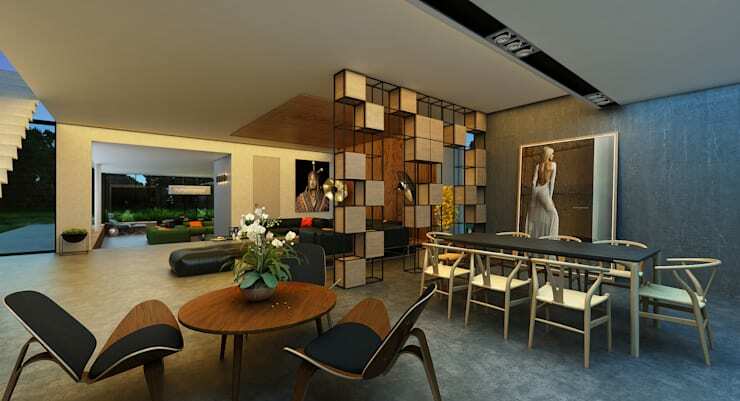 This space returns to the emphasis on unique wall textures, with a wooden panel wall that extends onto the ceiling. This has the effect of making the room feel more intimate and separate from the rest of the house. We love the addition of the photography lights in the background! Family photos taken in here would look amazing. 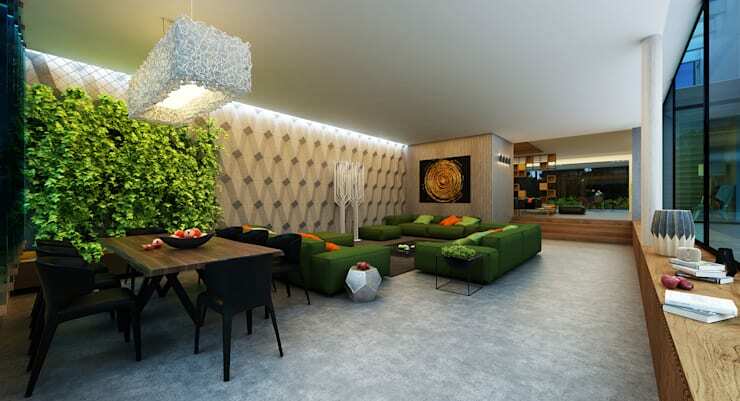 Here is another design feature that is meant to create more private spaces in this huge home. The partial wall is a great solution for this space, providing storage and partial privacy that doesn`t make the mistake of cutting these rooms off from one another completely. The result is a dynamic space that can adjust to the family`s needs. Here`s another perfect home for the (slightly smaller) modern family! What do you think of that all-white kitchen? Let us know in the comments!